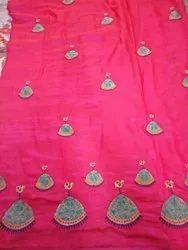 Laides silk sarees with embroidery work with fine quality zari and silk. We are a most trusted name in between the topmost companies in this business, instrumental in offering high quality array of Kora Silk Embroidered Saree. Janardhana Special. Banarasi Georgette Handwoven Silk Saree with all over Embroidery Work and a Fancy Zari Border. Adoring With a Rich Pallu and a 0.8 m Georgette Silk Blouse. Price range: Rs.1000 - Rs.20000 each.